Howdy, loyal followers! Today’s entry in Ivy On Celluloid is going to be a little different. Recently, I had the pleasure of speaking at the 2018 Con of Thrones, the largest fan-run Game of Thrones convention. My topic was highly related to the work I’ve been doing here: analyzing fictional portrayals of higher education. Below is a loose adaptation of the presentation I gave there, which took a look at the Order of the Maesters from Game of Thrones and A Song Of Ice and Fire. Let’s start with some introductions. I’m Gordon Maples- I have a BA in History, an in-progress MEd in Higher Education, and a pretty low-traffic film blog which you are currently reading. In fact, if you are reading this, there’s probably a 50% chance that you are a spam bot. If so, I appreciate your long-time support. One of the things I have been writing about a lot recently is the intersection of my interests – film, history, and higher education. My Ivy On Celluloid series is dedicated to analyzing the depictions of higher education on film, and trying to dig up historical bases for those portrayals. This brings me to Game of Thrones: while I was doing research for Ivy On Celluloid, my SO was watching through Game of Thrones for the first time. As I was watching along with her, I couldn’t help but think about the mysterious Order of the Maesters. While it isn’t a perfect 1-1 comparison, the Maesters are the equivalent to a medieval education institution in Westeros. 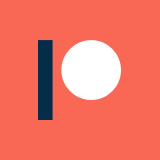 But, how far does it diverge from its real world counterparts, both past and present? Before I go any further, it is worth throwing a content notice on this: things are doing to get a bit dark towards the end of this post, as I get into the history of unethical experimentation and violence in research. Also, there is a non-zero chance that this is going to get super boring. Right about the time I get to the organization charts, you’ll be wishing you had your time back. Most accounts credit [the] foundation [of The Citadel] to Prince Peremore the Twisted…Peremore invited numerous scholars, including wise men, teachers, priests, healers, singers, wizards, alchemists, and sorcerors, to Oldtown. After Peremore’s death, his brother, King Urrigon, granted land alongside the Honeywine to “Peremore’s pets”, who developed the tract into the maesters’ Citadel. So, basically, a long time ago, a Prince of the Hightowers got a bunch of dorks together to hang out and think about stuff in Oldtown. Then, after he died, the King granted the order some land, on which they built the Citadel. I will point out the variety of the dorks, though: the fact that wizards, alchemists, sorcerers, and priests were involved is really fascinating, as I’ll get into later. Before I get back to the the origins of the order, let’s take a second to talk about the nomenclature of the institutional hierarchy. Doesn’t that sound neat? Here we go! When a student comes to the Citadel, they immediately become a Novice, until such time as they prove their proficiency in a field to the satisfaction of the preeminent expert in that field (the Archmaester). At that time, they receive a chain link of a metal corresponding to their field of study (I’ll get more into curriculum later). Once they have a chain link, the student becomes an Acolyte. Until they collect enough chain links to make a full chain (a distinction that isn’t exactly made clear), they remain an Acolyte indefinitely. Apparently, a good number of students at the Citadel never move beyond this level, either for lack of ability or lack of interest. Oberyn Martell, for example, is technically an Acolyte, because he earned a link for mastering poisons. However, he never intended to complete his chain to become a Maester. Should an Acolyte earn (x) number of links, they are made to go through a ritual, in which they are tasked with lighting a glass candle over the course of a night in an empty room. This task, however, is not meant to be completed (more on this later). Then, they take a vow of celibacy and service to the realm, and formally become a Maester. They are assigned to a paying House, and serve the lord of the keep to which they are assigned. At the time of the events of Game of Thrones, there are 300 Maesters. If a Maester proves to be the preeminent expert in a field of study, they can be appointed to the title of Archmaester. 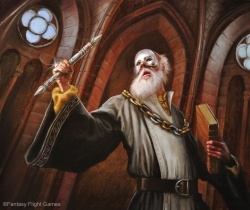 Archmaesters are located at the Citadel, and teach classes in their specialty to Acolytes and Novices, and also serve in the Conclave – the governing body of the Citadel and the Order of the Maesters, which selects the Grand Maester and determines the changes of the seasons. At the time of the events of Game of Thrones, there are 21 Archmaesters. Archmaesters, are, for the record, my favorite group of people in Game of Thrones. They basically try to do as little bureaucratic work as possible, even with their very limited responsibilities as a Conclave. The perfect example of this is the selection of the Seneschal – the executive officer of the Conclave. In an annual ceremony, the Archmaesters randomly draw stones in a sort of lottery election. The winner/loser in this lottery has to be the Seneschal, and actually do bureaucratic work for a year. They so dislike responsibility and power, that they basically draw straws for it. The loser becomes the most powerful Maester for a year. This is counter to every other system of power and thought in Westeros. 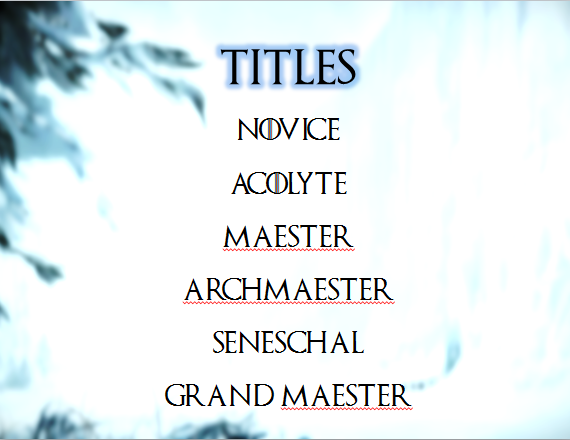 The last Maester-related title is the Grand Maester. When I first read ASOIAF, I assumed the Grand Maester was pretty powerful guy. Like, he must be the top Maester, right? He works directly for the King! As it so happens, the Grand Maester has no power over the other Maesters. He is essentially a permanent emissary assigned by the Conclave to have the King’s ear. Even better, the Conclave has a rich history of picking the oldest and least effectual dude available to assign to King’s Landing. Prior to the appointment of Pycelle to Grand Maester, they had appointed three consecutive octogenarians, all of whom died in the service of the same King. King Aegon V had to specifically request that they stop shipping him old/dying guys to sit on his council, after which they sent him the forty-something Pycelle, who has since become yet another octogenarian. Now that we’ve dug into the bureaucracy and titles of the Maesters, let’s look at real life for a second. If you thought Westeros was complicated, they ain’t got nothing on us. To the best I can gather, a Novice is a pretty close parallel to an undergraduate student, who is yet to earn a degree. An Acolyte covers everything from a graduate student (who has earned an undergrad degree) to potentially an Assistant Professor. This is because the tenure process, which stands between the titles of Assistant and Associate, is a pretty close parallel to the oath taken by the Maester’s, and their permanent assignment to a keep. It isn’t a perfect 1-1, but it is pretty close. 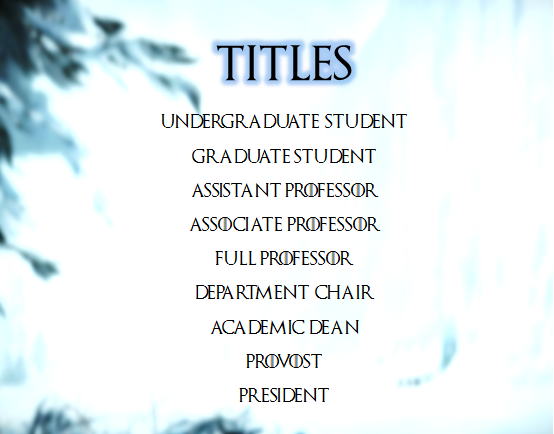 An Archmaester is probably close to a Full Professor, Academic Dean, or Department Chair, as these titles are all reserved for experts in their fields, and typically have a degree of bureaucratic responsibility. The Seneschal, for lack of a better equivalent, is pretty close to a Vice President/Provost or a President of a University. To visualize all of this, let’s compare organization charts! Woo! Here is the organization chart of Southern Methodist University, a roughly 12,000 student institution in Dallas, TX. It is on the small side of a large University – Ohio State University, for example, is five times the size of SMU. Gee, that’s probably pretty hard to read, huh? That’s because THERE’S A WHOLE BUNCH OF NAMES ON THERE. Modern Universities are massive institutions, with tons of people making up the cogs and gears. 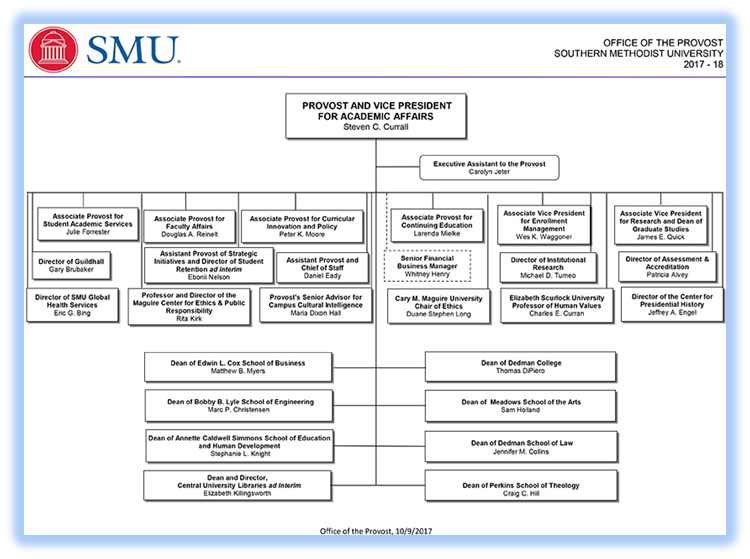 Here’s something even better: the chart above only covers the Academic Affairs branch of SMU’s chart: which is only a fraction of the total organization. Even better, this chart only goes as far down as the Dean level – Department Chairs are totally omitted. First off, you can see the 300 total Maesters at the bottom. Above that are the 21 Archmaesters making up the Conclave. One of the Archmaesters, denoted by a frowny face, is the unlucky one having to do actual work as the Seneschal. Off to the side is the Grand Maester, denoted by a red box emblazoned with the word “OLD.” Unlike the SMU chart, this is the entire organization. There are, essentially, only two tiers of power (unless you count the Seneschal on his own). It is a pretty simple organization structure, that is very easy to explain. It even fits in a single image, without leaving anyone out! It turns out that the Maesters’ disdain of bureaucracy has created a pretty lean system. On to the next topic, let’s talk about Church! Remember when I mentioned the collection of dorks who made up the original Maesters? 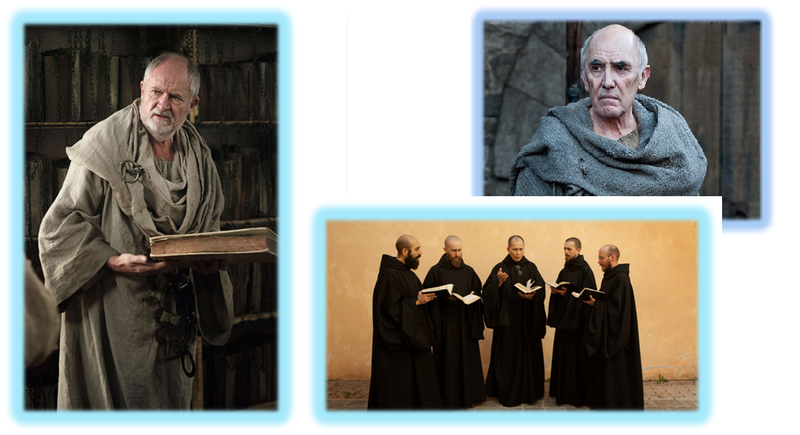 One of those dork categories was “priests.” While the Order of the Maesters is not explicitly a religious order, this is a bit of a nod to one of their closest real life counterparts – the monastic schools of the medieval age. Through the mid-eleventh century, monastic schools [were] the most stable force in education…much of the schools’ curriculum focused on teaching them to read and write Latin, and preparing them to join the ranks of the church…These monasteries [became] great repositories of knowledge, in that many of the books of the day were copied by hand in monastic scriptoria and stored in their libraries. If some of that reminds you of anything, it should. The Citadel library is definitely inspired by the libraries of monastic schools, and the curriculum of the Maesters training is almost all focused on training more Maesters. You don’t have to look far to see more quasi-religious elements of the Maesters. I mean, why else would they require celibacy? I see this as a pretty clear nod to their real life origins. Even their Conclave is based on Catholic bureaucracy. Likewise, their aesthetics are pretty clearly monk-ish in nature. In the world of ice and fire, GRRM essentially decided to split the real life institution of the Church into two independent parts: the Faith of the Seven, and the Order of the Maesters. And, honestly, it kind of makes sense. It was around this age in reality that the experts and scholars from the monastic schools split off into their own institutions – early Universities, like the University of Paris. As you might recall, the Maesters were granted land and recognition by the crown – in reality, the orders had to organize themselves into guilds, and then form universities on their own. All right, let’s get on to some symbolism! When you think symbols of academia, you probably picture a few different things. Maybe a diploma? One of those funny hats (a mortarboard)? A tassel? If you are Finnish, you might picture a sword and top hat! There are definitely a few different ones out there. Regardless of what you associate with academia in the real world, the Maesters absolutely have reality beat. On top of their iconic chains – the physical embodiment of their mastered arts – Archmaesters also get a ring, rod, and facemask forged of the metal of their specialty. Below, you can see a depiction of Archmaester Ebrose in full regalia. Because his subject is medicine, he is adorned with silver. Awesome. Speaking of chains and metals, let’s get into the curriculum of the Maesters. As I mentioned, the chain is the physical embodiment of a Maester’s completed curriculum – the metals of the links indicate what they have learned. In the real world, the closest thing to a chain is a transcript, which isn’t nearly as dramatic or visually compelling. It makes it much harder for everyone to know how many degrees / much debt you have. 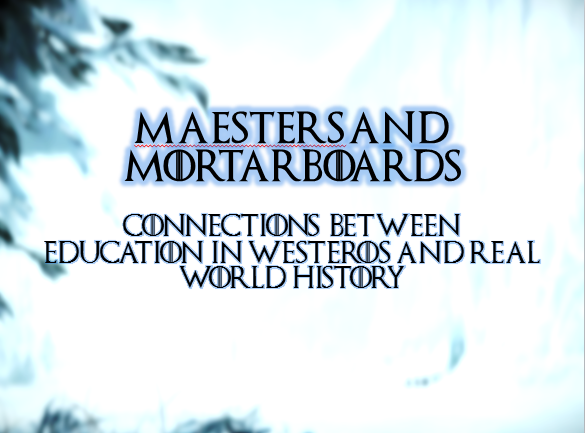 The curriculum of the Maesters is intriguing, particularly in how it contrasts to the history of education in reality. The subjects that we know are taught in the Citadel include medicine, astronomy (nautical navigation), warcraft, poisons, higher mysteries, math and economics, ravenry, history, herblore, and castle-building, each of which have their own metals assigned to them. However, this is not exhaustive. Again, we know there are 21 Archmaesters, each with a specialty. However, there may be more than 1 Archmaester per subject – that detail has never been clarified. This contrasts pretty starkly with reality. For a very long time, education curriculum was limited to the trivium – grammar, logic, and rhetoric – and the quadrivium – arithmetic, geometry, astronomy, and music. For the most part, these subjects were meant to provide a general, rounded education. However, in time, many became frustrated that colleges weren’t preparing people practical, career-based knowledge. In the United States, populist pressure for technical and agricultural education eventually led to the formation of A&M colleges in the late 1800s, which focused on practical education that readied students for specific careers. The purpose of education continues to be debated today, with people deriding and/or defending the merits and demerits of liberal arts and/or technical college ad nauseum. However, the Maesters managed to just skip over the conflict entirely. It didn’t take a cultural revolution to get them to teach practical knowledge alongside a traditional curriculum – they just sort of did it organically. Now, I want to touch on one of my favorite Maester-related topics – scholasticism and the supernatural. To set this up, I want to show a clip of a conversation between Maester Luwin and Bran Stark. Note the way Luwin talks about the supernatural and magic. This is representative of how the Maesters regard magic as a whole – they not only don’t give it credence, but they actively discourage research into it, and treat it explicitly like fantasy. While there is an Archmaester of the higher mysteries, very few students study it, and those who do are siphoned of their enthusiasm for it. Luwin is a good example of this – as a young man, he dreamed of magic, but his studies dispelled him of his fantastic notions. But, you might be curious – why do the Maesters dismiss magic? This is because they have a basis in the logic of scholasticism – the method of thought that gave rise to the scientific method, and modern scientific thought and reasoning. Scholasticism was…practiced in medieval schools. [It uses] techniques of Aristotelian logical inquiry to link Christian revelation, church doctrine, and the mysteries of the natural universe in a deeper and more reasonable understanding …The scholastics drew upon…logical analysis…establishing a common method of inquiry…and attempting to reason their way to a logical conclusion. We are led to believe that magic and the supernatural, as it exists in ASOIAF, does not have a basis in logic, and is therefore beyond the scope of scholasticism. This is true for reality as well – the academy is very focused on the observable, material, and real. If you want to put that to the test, ask a field biologist at random about Sasquatch, or any given Astrophysicist about alien abduction stories. The difference between reality and ASOIAF is that, in Martin’s world, magic was only dormant, not non-existent. Beyond this analysis, this just good world-building – the non-magical Westeros we are introduced to is more believable and tangible, and characters start exactly as skeptical as we are of the old stories and legends that seem beyond belief. However, this disdain for the supernatural leads us to one of my favorite tinfoil-hat theories from ASOIAF. I’m going to let AltShiftX describe Marwyn the Mage and the basis for what is known as The Grand Maester Conspiracy. Marwyn: We killed the dragons, Sam. The Maesters intend to destroy magic, Sam. Sam, they are after me, and I am under suspicion. Sam, I must go now. Goodbye, Sam! I just can’t wrap my wind around how else to take this interaction. This is a strange old man trying to rattle the rookie, and I absolutely love him for it. In any case, suspicion of the Maesters is not unique to Marwyn’s crackpottery. The common folk, for good reason, aren’t particularly fond of the Maesters. They have a bit of a reputation, as the servants of high houses, of not much caring for commoners, particularly when it comes to medical care. Even many highborn folks are suspicious of them, due to their perceived concealment of their true identities. Likewise, the Maesters having total control of communications has led many to suspect that they manipulate information to their own ends, as best serves their agenda. The Maesters read and write our letters, even for such lords as cannot read themselves, and who can say for a certainty that they are not twisting the words for their own ends? This is not unlike a lot of populist and right-wing criticisms of higher education today. It isn’t uncommon to hear allegations that higher ed institutions brainwash students, or have a liberal agenda, or that they don’t teach real or accurate information. So, the Maesters deal with a pretty similar issue of public suspicion here. However, the Maesters aren’t quite as elitist as they may initially sound. While they are definitely sexist and have a preference for high-born students, they don’t turn away common folks who wish to pursue knowledge. Boys and young men from all over Westeros come to study, learn, and forge their chains at the Citadel. There is no age requirement, and despite the prejudice of the archmaesters to status of birth, males of every social status are allowed to forge their chain. As such, baseborns, bastards, younger children of lords, and even royalty can study together at the Citadel. A Wiki of Ice and Fire, Maesters. In antiquity, education…was implicated in the structures of power, and specifically in training the rulers to rule and the ruled to be ruled. It was a largely exclusive process, and birth and class, rather than ability…were the operative criteria for determining who would be given training and knowledge. It created the empowered as empowered, the subjects as subjects. Too, Y. L. (2001). Education in Greek and Roman Antiquity. Leiden: Brill. Even today, education institutions are immensely elitist. Increasing access to quality education for women, racial minorities, and those of lower economic means is a major research focus and popular issue in education today. A huge part of that, however, is due to the cost of education, which easily stretches into the tens of thousands for a huge number of students seeking higher education. In Westeros, in contrast, the best education in the world, taught by the top masters in any given field, is completely free. The Maesters charge a fee for their services to all of the great and aspiring houses that house a Maester (which is all of them), and collect taxes from citizens of Oldtown. All of that money is put into the running of The Citadel, and the education of Novices and Acolytes. Basically, the richest of society subsidize the education of any (males) who wish to seek it. It is socialism with swords, y’all. Now, let’s get on to the dark stuff. Qyburn is the current Hand of the Queen, and thus currently one of the most powerful people in Westeros. He is also a former Maester, stripped of his chain due to a series of unethical medical experiments centered on how to subvert death, executed on unwilling participants and prisoners. So, there’s a long, long history of unethical experimentation in reality. There’s a whole wikipedia page just focused on unethical human experimentation in the United States. To be frank, this is important information for people to know – some terrible things have been done in the name of science and research, both inside and outside of the academy. Look up The Tuskeegee Experiments, The Stanford Prison Experiment, and Project MK Ultra, just as a start. It is a depressing wikipedia hole to go down, but an important one. I want to mention two specific examples, because of their similarities to Qyburn. The first of these is a man named Dr. Leo Stanley. Dr. Leo Stanley served as San Quentin’s chief surgeon for nearly four decades….Throughout, Stanley fixated on curing various crises of manhood. Under Stanley’s scalpel, prisoners became subjects in a series of eugenic treatments ranging from sterilization to implanting “testicular substances” from executed prisoners—and also goats—into San Quentin inmates. Stanley was convinced that his research would rejuvenate aged men, control crime, and limit the reproduction of the unfit. Dr. Leo Stanley was a eugenicist – he believed that actions should be taken to purify and improve humanity through genetic means. For the most part, that means he was a super-racist, hated people with disabilities, and was an all-around asshat. To these ends, he used his position as a prison surgeon to do a variety of experiments on non-consenting prisoners, including what was described above: implanting goat testes into people, and forcing sterilization. He was, not unlike Qyburn, a man who was absolutely sure that what he was doing was right, and for the best for humanity. He also abused his position to conduct wildly inappropriate experiments. Unlike Qyburn, he was never stripped of his degree – in fact, he was lauded by many, and worked for decades conducting his experiments on prisoners. Another example I want to look at is Dr. Julius Hallervorden, a Nazi. On October 28, 1940, Julius Hallervorden, a professor of brain anatomy,went to the extermination center in the Brandenburg jail. He was present when fiffty children were murdered by carbon monoxide. He dissected their brains immediately after…After the war he became subdirector of the Max Planck Institute for Brain Research in Frankfurt. There he published many papers on the brains…Certainly it was not Hallervorden’s idea to kill the children. He did not open the carbon monoxide valve. But to profit from the murder in such a way? Hallervorden’s science seems to be excellent. This makes the situation even worse in my eyes. LaFleur, W. R., Böhme, G., & Shimazono, S. (2007). Dark Medicine : Rationalizing Unethical Medical Research. Bloomington, IN: Indiana University Press. Just to recap, Dr. Hallervorden was a Nazi, was present for the murder of fifty children, and then immediately dissected their brains. For years after the war, he continued to publish on his childmurder brains, and even held a prestigious post a brain research institute in Germany. His contributions to brain research are still defended by many today, despite his complicity in and benefiting from the murder of children. I bring this up, in part, because people justify his actions in much the way Qyburn justifies his own. Also, it is worth noting the contrast between the treatment of Qyburn with the treatments of Stanley and Hallervorden. Qyburn lost his chain for his actions. Stanley and Hallervorden are still defended today, and got to retire with their degrees. I will say that there are thorough institutional review boards at Universities now, that aim to prevent unethical experimentation in the academy. Still, that doesn’t undo past actions, and defenders of atrocious experimentation practices are still out there. However, it is hard not to note how much more swiftly the fictional, medieval Maesters dealt with ethical violations than the real institutions. This concludes my run-down on the Order of the Maesters, and how they relate to the real-world history of the academy and research. This may have been interesting for you, or it might not have been. I hope it was the former, but if it was the latter, that’s tough. Thanks for reading!